Evening Makeup Look featuring Allechant Mineral Cosmetics! 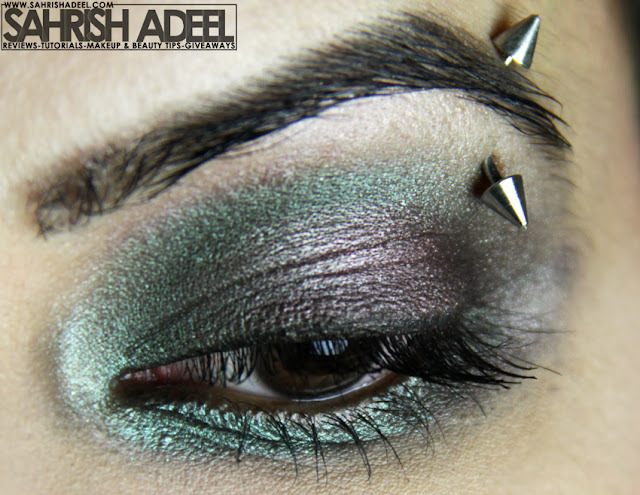 | Sahrish Adeel - Malaysia based Pakistani Beauty & Lifestyle Blogger! Evening Makeup Look featuring Allechant Mineral Cosmetics! Eye shadows that are easy and fun to play with & always give the best result are always on top of my makeup rack. These eye shadows amazed me before and made me create another look. Allechant Mineral Cosmetics says: "A different spin on unsurpassed quality, Allechant Mineral Cosmetics Loose Eye Shadow is a rich, vibrant loose powder mineral eye shadow. Allechant Mineral Cosmetics Loose eye shadow is completely hypoallergenic and free of all additives, preservatives and fragrances that can potentially harm the skin. With Allechant Mineral Cosmetics, the possibilities are endless. The colors are unbelievably rich and one jar can last you well over one year, if used appropriately." To read the my review on these eye shadows and see my previous makeup look, click here. Concealer Under Eye in 'Natural' by GlōMinerals. Mineral Eye Shadows by Allechant Mineral Cosmetics in 'Chestnut, Beigen, Army & Shelly'. To have a better look at these earrings, check out this post. I have already reviewed the foundation I used in this look. That is just amazing. I am so impressed by under eye concealer I used by GlōMinerals, I will review it soon as well. There are alot more reviews and makeup looks are coming on my blog in my upcoming posts. Don't forget to follow my blog to stay updated. Disclaimer: I am not paid or compensated in any way to use any products mentioned in this post. Read 'Policies' for more details.